Kinetika Bloco has performed at National and International carnival and performance events including: Ryde Carnival 2001-02, Notting Hill Carnival 2005/07, Belfast Carnival 2005, The Mayor’s Thames Festival 2000-2010, Beijing Olympic Cultural Festival 2007, unveiling of the Nelson Mandela statue 2007 and The Paul O’Grady Show 2009.We can provide you with an intimate band for a launch or press event to a roof raising extravaganza stage or processional show. 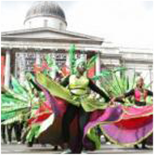 The Kinetika Bloco is keen to collaborate on music projects and in the past we have worked with composer James Morton on The Compass Suite, Dan Zanes and Friends at the Southbank and performed at the London Jazz Festival 5 times. The Bloco began life as a Bateria and over time has added a brass section, dancers and this year we will be integrating a steel pan section. Our music has a strong improvisational nature and is influenced by many different cultures and then rooted into our own South London youth culture. We have elements of samba band, marching band, and jazz band resulting in a unique hybrid that doesn’t look or sound like anyone else! We have covered music as diverse as Sun Ra, Fela Kuti, Disney, Folk Songs, Dizzy Rascal and Michael Jackson. Music and dance have the power to engage and excite young people, to stimulate their social and personal development, educate them in different cultures and inspire discipline and confidence. Kinetika Bloco has delivered schools workshops across the country from Devon to Derby and we can offer your students an exciting, dynamic workshop experience. 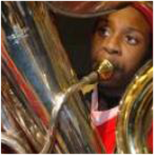 We offer: one-off full day music and dance workshops with up to 70 young people; tutors to lead regular after school music activity; or more sustained support to help you set up your own Bloco. 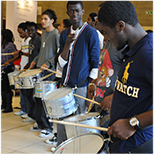 The workshops can fit into activities week, kick off a launch of music or carnival activities in the school, or be used as a tool to build self esteem of the students and a sense of community within the year group. 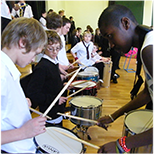 Workshops always result in a performance / sharing opportunity which can be shown to the rest of the school. We are flexible to the needs of your school and can tailor a workshop to your requirements. Workshops are led by a team of Professionals and our Trainees, who students find very inspiring examples that they can look up to. Kinetika Bloco has helped to establish and support 8 Bloco’s around the country over the last few years, we are keen to share our successful model and help you to start something similar in your area. We believe in the benefits of partnering with other organisations. We can provide a variety or workshops to either kick start the process or help you to move on to the next level. We are also happy for organisations to visit us and see how we work. Do you want a team build that will inspire creativity, motivate and align your team, break down communication barriers and support an exciting UK youth charity! We believe that music, dance and the arts can help team members develop many skills and that our workshops will bring real value to your team resulting in greater commitment and engagement. The company will benefit from a more cohesive team that performs better leading to greater efficiency and productivity and above all your team will have a fun day together. So how about investing in your business and showing your employees that their success is important for the success of the business. This kind of motivation is key to ensuring that each individual feels valued, has a chance to express their unique qualities and understands that the sum of the group’s success outweighs individual success!